The child's name, date of birth, time of birth, and weight are hand gilded in Gold across the banners at top and bottom of the baby plate. The hands on the clock also indicate the time of birth. A maximum of 25 letters is allowed for the child's name. 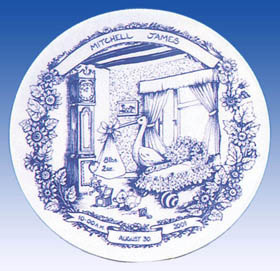 The Personalized Birth Plate is 8.75" in diameter. 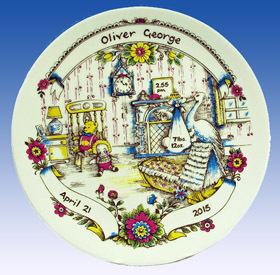 The child's name, date of birth, and time of birth are hand detailed in Blue across the banners at top and bottom of the baby plate. The hands on the clock also indicate the time of birth. The birth weight is shown on the storks bundle. A maximum of 25 letters is allowed for the child's name. 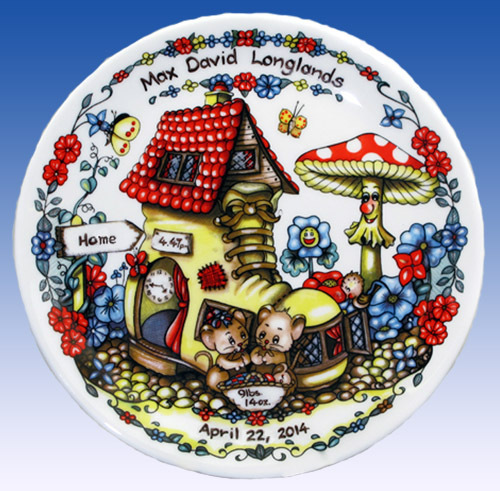 The Birth Plate is 8.75" in diameter. 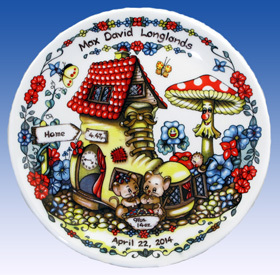 Exclusive to Heron Fine China Nurseryland depicts 2 mice living in a big old boot in a magical garden. Below the 2 mice is a basket holding the newborn baby mouse. The child's weight is shown on the basket. The time of birth is depicted on a wall clock inside the boot and in digital form on a placket above the entrance to the boot. 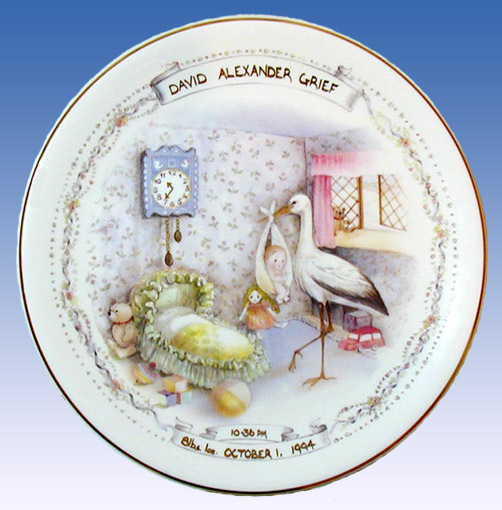 The child's name is hand gilded at the top of the birthplate and the date of birth is shown at the bottom of the 8 inch birthplate. A maximum of 25 letters is allowed for the child's name. 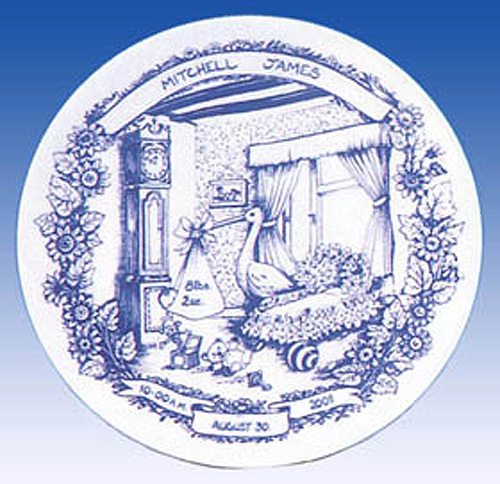 One of the first Heron Fine China birthplates has a full nursery design with the stork carrying the baby carefully towards the crib with the baby's weight shown on the storks bundle. The time of birth is depicted on the wall clock and in digital form above the baby's dressing table. The child's name and date of birth are hand detailed across the banners at top and bottom of the 8 inch birthplate. A maximum of 25 letters is allowed for the child's name.